In this post, I’m going to share with you a quick lifestyle hack for entrepreneurs that has been working really well for me lately. I should inform my reader that I grew up playing online poker and pretty much didn’t work in pants from the age of 18 onward. Most people dream about this lifestyle, and while I’m grateful for the flexibility that my lifestyle offers, I’ve personally found it to be uninspiring—even depressing—wearing a robe at 5:00 in the evening. I’ve been challenging the notion of dressing down because of what it implies: that our day isn’t worth putting on something more energizing. A refusal to get dressed is not always a preference for comfort, but a statement that we don’t value what we are doing enough to dress for the occasion. It’s easy to see how this could be a slippery slope: I may as well stop showering. I can’t take credit for this lifestyle hack; I stumbled upon it out of necessity. While filming YouTube videos, I felt compelled to shave and present a professional image. Most of the time, I’d end up taking a cold shower to get charged up before filming. This would inevitably result in a change of attire. In fact, the ritual of getting ready helped prepare me psychologically and emotionally for the high energy output I needed in order to create an inspiring video. At the poker table, I noticed that my pregame routine has the same impact; it serves as a way to get me mentally ready for the battle ahead. In short, what I wear (and specifically the commitment to changing my outfit) has a significant impact on my mood and energy; consequently, instead of defining success as the absence of wearing pants, I now strive to match my outfits to enhance and manifest the energy I’m attempting to create. And since I’m obsessed with optimizing my performance, both on and off the poker table, on a personal level, I enjoy the process of experimenting with how style can influence state of mind. For example, after hearing the adventures of A.J. Jacobs and his attempt to live a year literally following the bible, I began wearing more white clothing. Jacobs, who discovered this hack by happenstance, said that wearing white had a surprising impact on his mental state of mind, making him feel better, lighter, and happier. After several months of implementing Jacobs’ theory, I converted to wearing white for similar reasons. While my old daily routine would often leave me dining in my robe and underwear, I’ve recently started mixing up my attire; as a result, depending on the day of course, I now find myself typically changing attire 3-4 times a day. Here’s a glimpse at the types of clothes I’ll wear during a typical, daily routine. Pre-Work: absorbing content, writing, meditation, journaling. Work: emails and customer service. Deep Work: brand development, creating content. Attire: I’ll usually take a break, change for the gym, and then shower when I’m home. Wind Down: dinner, family time. Before Bed: reading, meditating, journaling. I’ve noticed that this process of changing, albeit meticulous, works really well for me. It’s not so much that having a different physical outfit makes me perform better, rather, for someone who is constantly juggling a lot of projects, the ritual of changing in-between tasks helps serve as a necessary mental prep of getting me in the zone and focused on the nature of the task at hand. The last, unexpected, benefit I noticed from this odd, behavioral habit is the positive impact it’s had on my relationship. My wife and I have similar lifestyles (we both work from home); so for me, it’s nice to see that your partner takes care of himself or herself. In short, it makes people become more attracted to one another by adding a subtle, surprise element of how they present themselves. There’s nothing more of a buzz kill to desire than seeing your partner in the same pajamas for 90% of your waking hours. 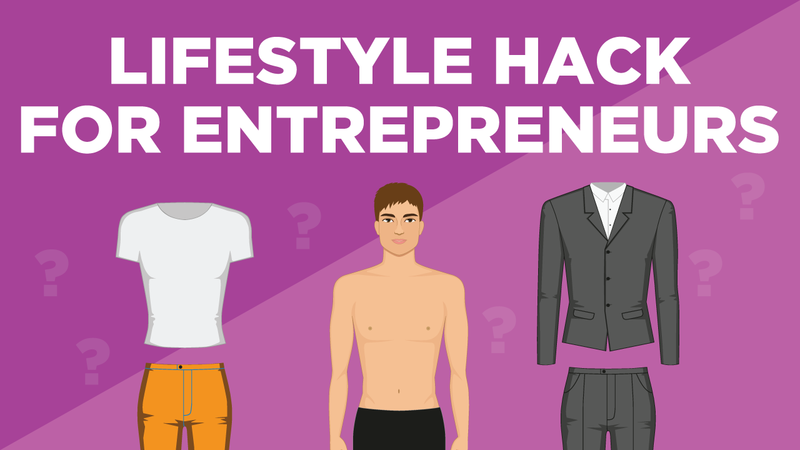 Have you experimented with changing clothes as a lifestyle hack? Please share your thoughts with a comment, below. Any lifestyle hacks for entrepreneurs that you can add would be greatly appreciated. Mmm interesting, i do not have a lot of cloth since i moved to Poland but i will start to apply some of this tips. Actually i know a little about the psychology behind the colors and i want to buy t-shirts with each color of the rainbow and as well some white ones, i know improves your mood in general. So i may save some $ and get some not dark cloth ( WHICH I LOVEEEE! )… but yeah… i need to keep trying and see if i get some positive impact in my daily basis.